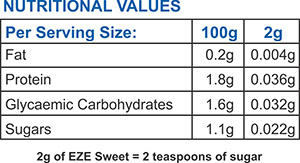 What is the cost of EZE-Sweet per cup if I usually drink 2 teaspoons of sugar? With EZE SWEET, you would use one teaspoonful versus 2 pills of other popular brands. One teaspoonful of EZE sweet will cost you R0.28, which is how much it will cost you per cup of tea, if you typically drink 2 teaspoons of sugar in your tea. This calculation is based on 800g EZE sweet at our suggested retail price of R60.00. Can EZE-Sweet be used by people who suffer from Diabetes? 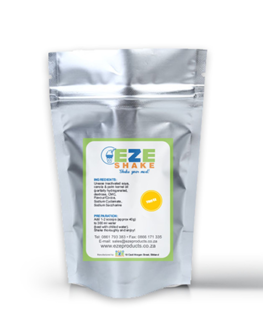 We have many customers with diabetes who use EZE SWEET with success, but due to the complexity of diabetes, you must test EZE SWEET for yourself and make your decision if it works for you or not. We suggest you consult your physician if you are unsure. What is Glycemic Load (GL) and how does it relate to a sugar substitute like EZE-Sweet? Glycemic Load (GL) refers to the impact that a food’s carbohydrate content has on the level of glucose in the body, taking into account the type and amount of carbohydrate consumed. 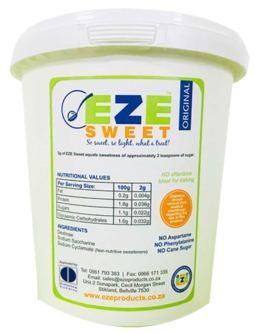 Using EZE-Sweet in place of sugar can help to reduce the Glycemic Load (GL) of the foods you consume. What is the Glycemic Index (GI) value of EZE-Sweet? Glycemic Index (GI) is a measure of how fast carbohydrate foods are metabolised into glucose and thus affect the blood sugar levels. Most sugar substitutes contain a very small amount of carbohydrates and are not classified as foods. Assigning a GI value to a sugar substitute is not a proper use of the GI concept. The Glycemic Load (GL) is a more appropriate concept for sugar substitutes. What is the biggest quantity ingredient in EZE-Sweet? The most important component of the product is obviously the one of greatest quantity. That is the long chain fiber molecule, which is modified from corn (mielies). This modification alters the starch molecule and turns it into a long chain molecule that resembles fiber to the body. These molecules are called Dextrose and are known as a simple sugar, which tastes slightly sweet and is very good for you body. What non-nutritive sweeteners are used? Sodium Saccharine & Sodium Cyclamate are the other very minor ingredients. They are chemically derived molecules, which complement the intenseness of taste and fool the taste buds. It is completely safe and accepted food ingredients, in most countries, for the past fifty or more years, without any adverse conditions ascribed to it directly. These are of the oldest sweeteners in use. evel of glucose in the body, taking into account the type and amount of carbohydrate consumed. 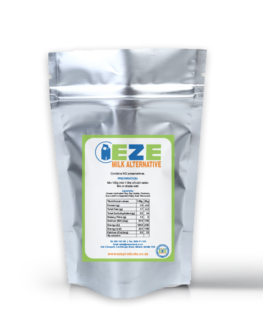 Using EZE-Sweet in place of sugar can help to reduce the Glycemic Load (GL) of the foods you consume. Can EZE-Sweet be used to cook and/or bake? Yes, EZE-Sweet can be used in cooking and baking with great success. You might have to test your recipe, but usually, if you use between one third and half of the volume of sugar the sweetness should be the same as when you are using sugar.